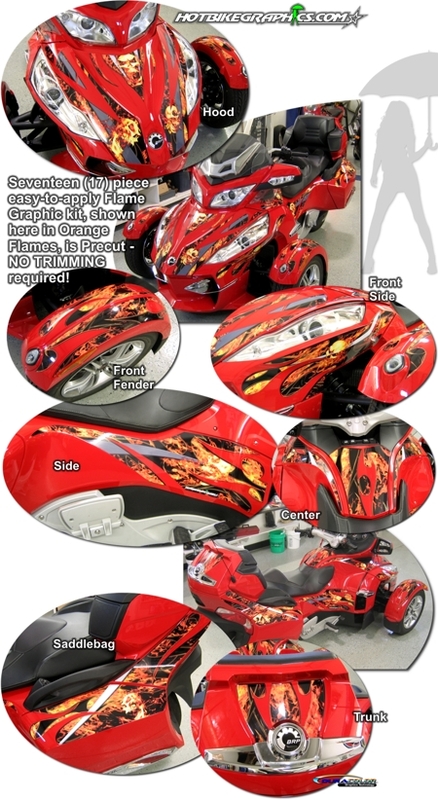 Set your Can-Am Spyder RT apart from the rest with this great-looking seventeen (17) piece Flame Graphics kit. Precut to fit the '10-Current Bombardier Can-Am Spyder RT, the graphics are easy-to-install and make the bike look great! The DuraCOLOR manufacturing process for this item features Real and Reverse Cut Traditional Flame components as well as Flaming Screaming Skulls. Available in two (2) color choices, graphics are covered with a 2.5 mil clear laminate which will protect the graphics from miles of abuse. Note: Graphic kit is bike specific and will not fit any other motorcycle.